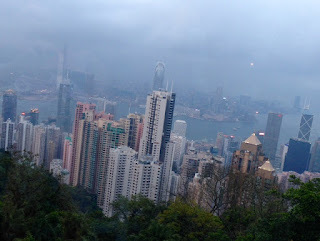 PART TWO: I was made incredibly welcome by my university and by the friend who had originally told me about the residency, but Hong Kong is not an easy place for artists. Its status as one of the world’s biggest commercial and financial centres is deep-rooted, and most of the westerners living there are young, ambitious professionals. At the first social event I attended (a beach barbecue), I was repeatedly asked about what a writer earns and little or no interest was shown in what a writer does. While the traditional Chinese blend of caring for body and spirit simultaneously is much in evidence – Chinese medicine stores, reflexology parlours, groups ranked like the Terracotta Army performing Tai Chi in the parks – the leisure time of the Western population revolves around competitive sports. On weekend hikes, my tendency to stop and look at views rather than see how quickly I could complete the route was regarded with mystification. Cultural events tend to be more the kind of thing you want to be seen at rather than attending for its own sake. There are regular high-level tours by big international theatre and opera companies, and an exhibition mounted by the Basel Art Gallery every spring, but what really excites Hong Kongers is the Rugby Sevens tournament, which brings Central to a boozy, testosterone-fuelled halt for a weekend in May. Competitive pressure shows itself more painfully among the Chinese population. At Lingnan, I taught mainly third and fourth year students, who were coming up to their finals. Although my classes were in English creative writing and basic linguistics, we were left in no doubt that this was a luxury, that the students’ real focus must be on improving their language skills in order to get well-paid jobs in international companies. Even in the local middle school, where I led a drama project with eight to eleven-year-olds, this was the case. At the end of my semester, my students produced an anthology of their fiction and poetry in English. Nearly all of this dealt in one way or another with the pressures imposed on these young people by their parents, to work hard, achieve high results, get good jobs. Hong Kong has no welfare system and it’s traditional for children to support their parents in their old age. In Chinese society also there is little understanding of art for art’s sake. On a personal level, I was going through the surreal process of getting divorced at arm’s length. My third novel, Erosion, was published in April 2014, in the middle of my stay, and I felt oddly out of control of that process too, as if the book were a child who had left home without leaving a forwarding address. The book I was writing, entitled Love Can Kill People, Can’t It? (now on its final edits and hopefully for publication next year), is set in Palestine and Yorkshire. My own transitional and impermanent state was reinforced by the world around me. Hong Kong’s history is determined by its geographical location on a major trading route through the South China Sea. Its native people have virtually disappeared and been overtaken by incomers from all over the world. Most of the Chinese who live there now are descended from mainlanders, economic migrants or refugees from the upheavals of the Maoist era. Westerners rarely stay longer than three or four years, the Philippina and Indonesian maids send most of their money home so put down no roots in the Territory. Triad money flows through Hong Kong’s shopping malls on its way to the West. Everything is temporary, everyone is in flux. It was an hour’s bus ride from my home in the New Territories to Central. The bus travelled along the shore, and I could look out over the narrow channel between the mainland and Lantau, where Hong Kong’s airport is located on land reclaimed from the sea. The channel is a bit like an aquatic M25, crowded with tiny fishing boats, inter-island ferries, leisure craft and container ships the size of Manhattan. Aircraft lumber up from Lantau and seem scarcely to miss the bus roof en route to Shanghai or Tokyo or Sydney. A cat’s cradle of suspension bridges, glittering with traffic, links Kowloon to Hong Island, whose iconic skyline emerges mystically from the smog. (I never did manage to get a good photo of the distinctive clawed roof of IFC1, from where Christian Bale’s Batman abseiled in The Dark Knight Rises.) I was struck by the way in which the natural and the manmade have combined in this city, whose sun rises eight hours ahead of Europe’s, and which is altogether brighter, faster, more exciting and more alive than any European city I know (and I will defiantly include London here! ), to create an extraordinary beauty. A beauty whose particular quality lies in its unnerving transience.